What's the first thing you bought on the web? When I was growing up in Kentucky, I spent most of my time escaping boredom by dancing. And because I was from the middle of nowhere as far as dance was concerned, I spent my weekends caravaning to new cities for competitions, conventions, and training. On these trips out of town, I envied the more urban experiences of my far flung dancing competitors. I'd learn about their trends and gossip through backstage dancer chats, by overhearing their mothers chatter in dressing rooms, or by gleefully reading the dinky monthly and weekly paper dance publications that hit my dance studio's front steps. These were my avenues for information, and they were few. I had a voracious appetite for learning everything I could to advance my dance ability, but my very small world of Kentucky didn't provide enough. Despite a whole heck of a lot of natural talent and an unstoppable desire to improve, I was always playing second fiddle to competitors with geographic access. My competitors in big cities had better dance instructors, better dance schools, a thicker pool of competitors in their own training programs, fancier ballet summer programs, invitations to arts boarding schools, and copious performing opportunities. And they also seemed to have another thing in much greater supply... costumes. My competitors in urban areas could either find their ways to marvelous fabric stores (like Britex in San Francisco where my mother and I would go every few years) or go to readymade theatrical supply stores (like Capezio in NYC where I'd stock up on leotards and character shoes each summer). Some of my competitors even trained at large studios that hired costume designers and sewers in-house! But alas, being geographically far from all these things meant that more often I was mail ordering unsatisfyingly designed readymade costumes or very creatively embellishing store bought leotards with findings from a middle American sewing store called Piece Goods and with fabric bits from lingerie and formal wear from the local Lazarus. For a year or two of solo competition, my mother and I craftily collaborated on some less than professional dance costumes. But quickly, I had enough of a taste of the professional theatrical supplies and costumery available to my competitors that I needed something better. And so it was that when I vowed to get serious about costumes, I turned as a last resort to this new thing called the Internet. Where I had been absolutely unable to find stretch velvet, sequin rick rack, flesh mesh, and the other raw components of dance costumes in our local town, we found a hobbyist's collection of such costume finery on the Internet! But surprisingly, RHINESTONE GUY turned out to be an early hero of ecommerce! My mother and I received our first carefully addressed package, a handmade sample card of all the available rhinestone stock, a few weeks after phoning the number on the Internet. Brilliant! 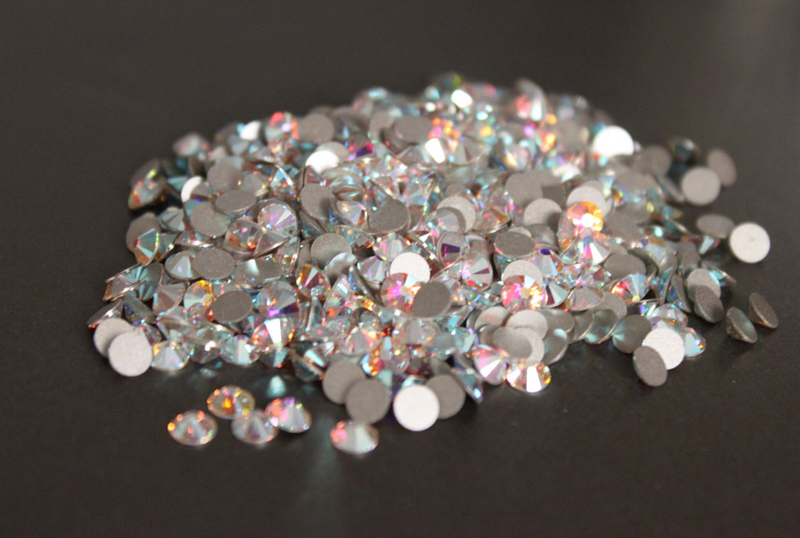 Very quickly, my mother and I were sending emails to RHINESTONE GUY and receiving little clear bags brimming with rhinestones of specific sizes, colors, and finishes we had never dreamed existed! Where we had previously been painstakingly reusing plastic rhinestones from a craft store, we could now send away for entire packs of gloriously colored and cut crystal rhinestones! Swarovski Rose AB flat backs? Yup, those were painstakingly glued in a sparkling pattern on my ivory lace lyrical costume in 10th grade. Czech Jet AB in varying sizes? Yup, those went on the straps of my black velvet jazz costume in 11th grade to give them a blue/green shimmer. I even learned a new vocabulary to discuss the richness of stock that RHINESTONE GUY offered. Cuts, brilliance, sources, sizing, measurement, counting! It was a wild black hole of new information, and I dove right in. As you might guess, the rhinestones that my mother and I purchased from RHINESTONE GUY would later be affixed to costumes that took me not only to a more competitive place in costumery but to a more competitive place in dancing. The rhinestones shone on dresses I wore in performances everywhere from NYC to LA and on stages and even television... Because alongside the more trivial rhinestone research, I was also deeply engrossed in Internet explorations of dance technique, my competitors, performance tricks, stretching practices, and eventually... research on how to transform my training in the arts and academics to get myself out of my native Kentucky and into college far, far away. And so it was that my very first ecommerce purchase would be a harbinger for the most important things that the Internet would end up doing for me. Many times thereafter, the Internet would again give me ways to get out of my head, out of my small town, out of my middle of nowhere state, and much closer to the national 'stage' and 'players' that I so desperately wanted to be a part of.